Simons Electric - servicing and installing video cameras and surveillance systems in Waukesha, Brookfield, and Milwaukee. Simons Electrical Systems can design and install a complete array of products that will meet your video surveillance needs. 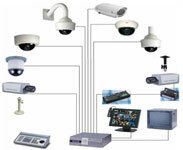 We have a full line of disguised video surveillance cameras, high resolution color surveillance cameras, pan/tilt/zoom speed domes, wireless cameras, digital video surveillance recorders (DVRs), time lapse VCRs that record up to 980 hours on a single tape, flat screen monitors, and remote video surveillance equipment. Through us you can remotely control and monitor your equipment, whether you are in Waukesha, Milwaukee, or anywhere in the world. For external video surveillance, we have heated, ventilated, weatherproof high wind resistant cameras and enclosures. If you need to see in the dark, our day/night or infrared cameras have low/no light viewing capabilities. We also offer protective enclosures for our cameras from tamper proof to bulletproof. Through the use of CCTV systems a significant reduction of crime and anti-social behavior has been achieved by providing 24-hour surveillance of vulnerable areas. The police are aided in tracing goods and apprehending criminals with the aid of the video recording of events and incidents.